Kite Beach Inn is a 26-room beachfront hotel located directly on Kite Beach in Cabarete, on the North Coast of the Dominican Republic. Kites can be launched on Kite Beach directly off our property. 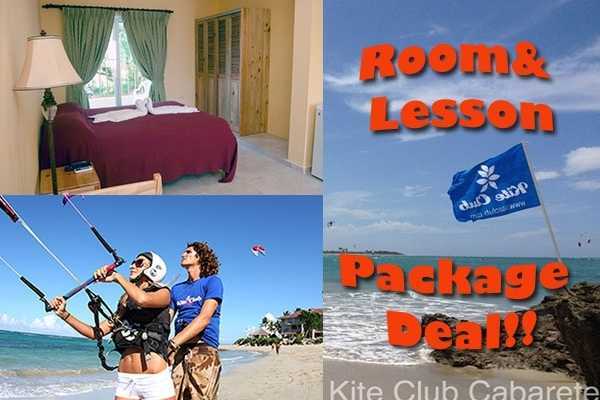 You can also take kiteboarding lessons with our affiliated IKO kiteboarding school Kite Club Cabarete right next door. At Kite Beach Inn, you have the easiest and most direct access to Kite Beach. We pride ourselves in providing the best valued hotel rooms right on Kite Beach. Kite Beach Inn also provides a casual, friendly and fun atmosphere where you can simply hang out and relax or meet other like-minded people and make friends. Many of our guests enjoy surfing in the morning and kiteboarding in the afternoon. Guests also enjoy the vibrant Cabarete nightlife with many clubs and restaurants located along the beach in downtown Cabarete. Kite Beach Inn provides modern amenities allowing you to be as active or relaxed and comfortable as you wish. You can chill out on our many lounge chairs around the pool and on our wood deck, connect to the real world via free high speed internet, eat and drink at our Coco Loco beachfront restaurant/bar, play beach volleyball or rent water sport equipment. Kite Beach Inn also has a diesel back-up generator for 24/7 electrical service, hot water, a communal kitchen, on-site security, maid service and paid laundry service. Our on-site hotel managers can arrange taxi service, book tours, book kiteboarding lessons and surfing lessons for our guests. We pride ourselves in providing excellent customer service because we understand happy guests mean good word-of-mouth and repeat guests. 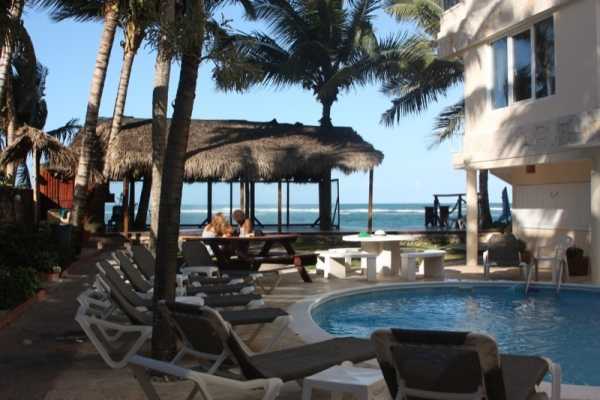 If you are looking for the best and most affordable hotel location in Cabarete for kiteboarding, Kite Beach Inn is for you. We look forwards to meeting you. This accommodation is right on Kitebeach next to the Kite Club school, you'll be right where all the Kite action is! Rooms can be booked as single, double or twin occupation, and sleep up to 3 people max for no extra charge. All Standard rooms come with en suit bath, 1 queen or 2 single beds, air conditioning, digital cable TV and free WiFi. You'll have easy access to the pool, kite beach and all of Kite Club facilities. All Studios come with air conditioning, private bath, digital satellite TV, WiFi, kitchenette with fridge. Ground floor Studios come with 2 or 3 single beds, great for freinds on a budget! Sleeps up to 3 Ocean view Studios come with 1 queen + 1 single bed and a balcony with ocien views Penthouse Studios come with 1 queen bed and stunning ocean views. You'll have easy access to the pool, kite beach and all of Kite Club facilities. Standard Room USD 49.00 per night Standard Room 2 Twin Beds, air conditioning, en suit bath, digital cable TV. Ground Floor Studio USD 69.00 per night Studios come with air conditioning, private bath, 2 or 3 single beds, digital satellite TV, WiFi, kitchenette with fridge. Ocean View Studios USD 79.00 per night Studios come with air conditioning, private bath, 1 queen bed + 1 single bed, digital satellite TV, WiFi, ocean view, kitchenette with fridge.